I wish to have more blessing to come, more happiness and good health for me and for my family. I will share you the recipe for you to try. Preheat oven to 350 degrees F (177 degrees C) and place rack in center of oven. You will need two ungreased baking sheets. In the bowl of your electric mixer or with a hand mixer, beat the butter and sugar until fluffy (2-3 minutes). Add the egg and vanilla extract and beat until incorporated. On low speed, gradually add the flour and salt and mix until incorporated. Scrape some of the dough into your cookie press that has been fitted with a decorative plate. Hold the cookie press perpendicular to the ungreased baking sheet, with the tip almost touching the sheet, and squeeze and trigger. 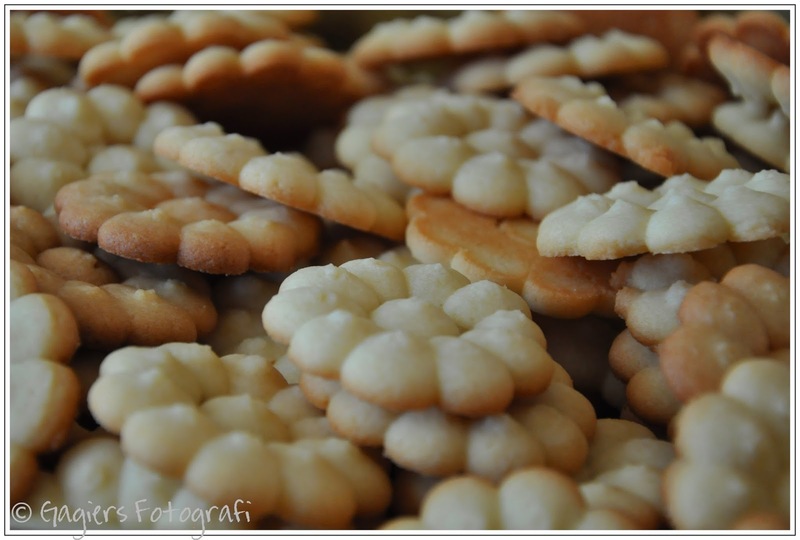 ( if you find the dough is too soft, because the shape of the cookies is not clearly define, then chill the dough). Continue to press out the cookies, spacing about 1 inch apart. If desired, decorate the cookies with pieces of candied cherries, nuts, colored sprinkles or colored sugar. Have ready a pastry bag fitted with a 1/2 inch diameter open star tip. Fill the pastry bag about half full, twist the end of the bag to close and pipe 1 1/2 inch rosettes or stars by holding the pastry bag perpendicular to the ungreased baking sheet, with the tip almost touching the sheet. Squeeze the pastry bag firmly and evenly without moving it until the shape is the desired size. Stop squeezing and push the pasty bag down a little and lift the pastry bag straight up. Continue to pipe cookies, spacing about 1 inch apart. If desired, decorate the cookies with pieces of candied cherries, nuts, colored sprinkles or colored sugar. Bake cookies for about 6-9 minutes or just until the edges of the cookies are barely tinged with brown. Remove from oven and gently transfer the cookies to the wire rack to cool completely. These cookies will keep at room temperature for about 1 week or they can be frozen for several months. Guys, I want to introduce to you my new website Flash & Style Fotografi and it's official blog Flash & Style blog. Feel free to visit and please don't forget to leave comments (positive or negative comments are all welcome) so that I can improve my website. 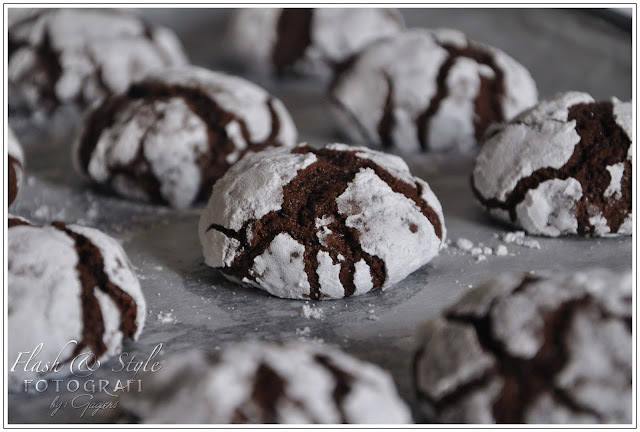 This is my first try of chocolate crinkles. I been thinking to making some before but I didn't have the guts to do it because I'm so afraid that it will not be successful until I tried last december. I thought it's complicated when I read the recipe but it isn't. Everybody loves it and I did many times already since december. Arrange in a serving platter then serve. Share and enjoy!